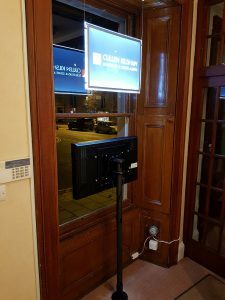 A2 Landscape LED light pocket suspended from ceiling, with our customer’s logo and below this, a networked digital media screen below, which can be controlled by our customer from anywhere by logging into our online software digital signage portal. for our Borders-based customer in their new Jedburgh town centre office. The screen is suspended on a black 50mm steel post which is mounted to the floor. 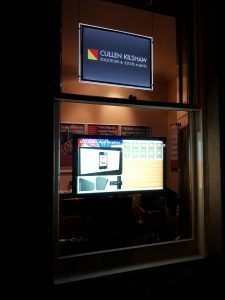 This window looks onto a busy main street in the town centre with busy through traffic, so the illuminated window display, and the moving pictures of our high brightness screen are great for highlighting the presence of our customer’s High Street office.